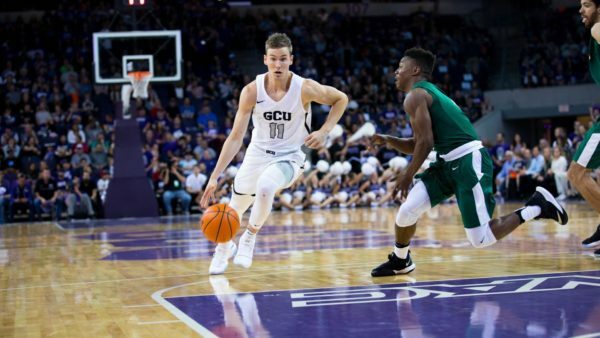 What to expect: The talent gap between New Mexico State and the rest of the conference is substantial, a reality which the final standings confirmed; Marvin Menzies’ team cruised to a 12-1 WAC record and won the league by four games. The Aggies are led by an athletic point guard, senior Daniel Mullings, and one of the tallest frontcourts in college basketball. Since losing to Seattle in mid-January, the league champs have reeled off 11 straight victories, including their last seven by an average of nearly 16 points per game. And on top of all that, they are the only team with a bye to the semifinals. 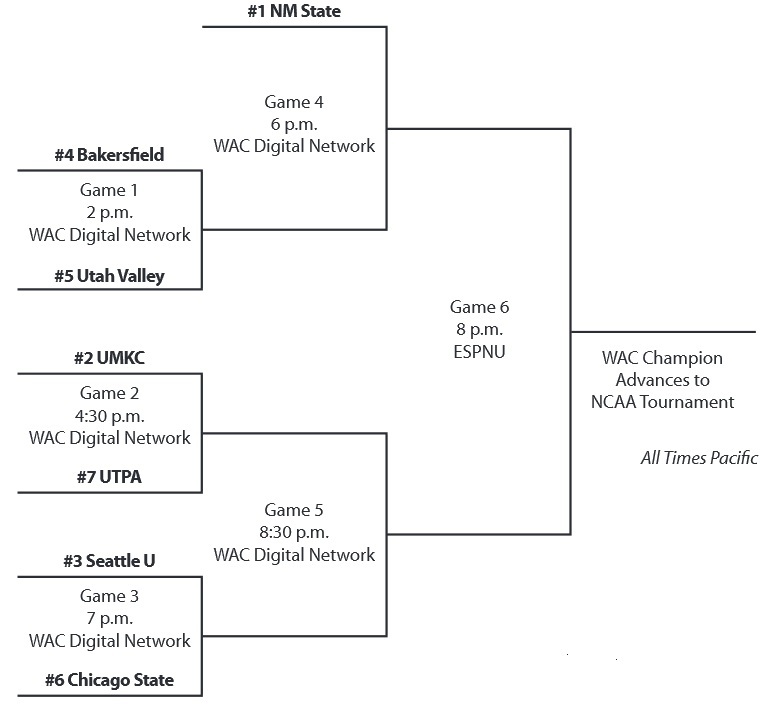 It’s hard to imagine the Redhawks or any other challenger stopping them from reaching a fourth-straight NCAA Tournament. 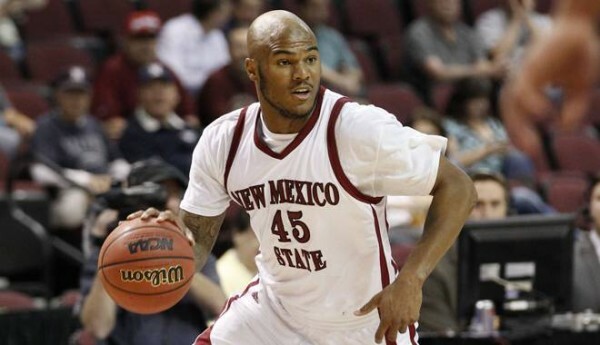 Favorite: New Mexico State. The Aggies were hit with the injury bug in early December, losing preseason all-conference forward Tshilidzi Nephawe for one month with a foot injury, and Mullings – reigning WAC Player of the Year – for eight weeks with a broken finger. Both are back and fully healthy, and the team now looks as good as it has all season. That is bad news for everyone else. Out of the seven players who played major minutes for Washington in 2011-12, one is lost to graduation and the other two decided to depart Seattle early for the NBA Draft. A fourth player, also graduating, only averaged 2.8 MPG and picked up those minutes in garbage time. The two players that skipped town early were guards, but there are both young and experienced players waiting in the wings at the position who are ready to take over. Replacing a pair of senior forwards will be a slightly more difficult task, especially early on in the season when the Huskies will face Seton Hall, Saint Louis, Connecticut, and possibly Ohio State. Below we fill you in on their details in their order of importance to the program. 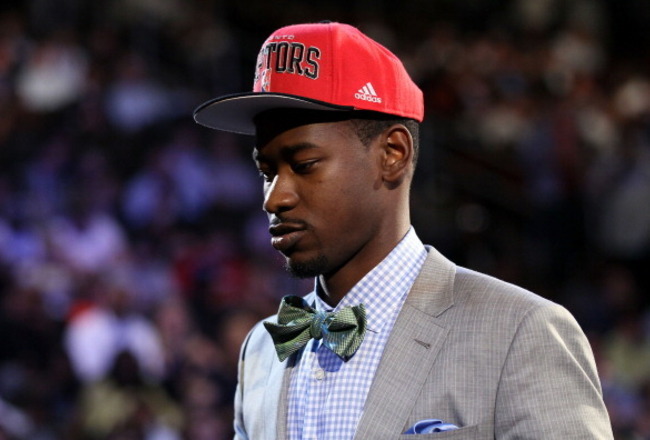 Terrence Ross – Two years ago, Ross came out of Portland’s Jefferson High School (where he played alongside former Kentucky forward Terrence Jones) and immediately earned good playing time with the Huskies. He had a solid freshman season, averaging 8.0 PPG and 2.8 RPG while playing behind Isaiah Thomas. Then came last season, and with Thomas gone and guard Scott Suggs lost due to a foot injury, Ross’ production and responsibilities grew. He averaged 16.4 PPG in an average of 31.1 MPG, but his reason to leave school early lies within the increased production on the boards. Ross bulked up over the summer and became much more active in a small forward type role, averaging 6.4 RPG. Tony Wroten, Jr. – 16.0 PPG and 5.0 RPG were enough for Wroten to head to the NBA after just one season on Montlake. The freshman was a huge part of every game, and he knew how to perform the job that needed to be done night in and night out. Only seven points against Florida Atlantic? No problem, as he focused on dishing out four assists to the guys that were making shots. Only eight points against Utah? He made up for it on the other end of the court by getting two steals, which ended up being huge in just a four-point win. The point is, despite many of his freshman mistakes, Wroten was a do-everything type of player, and he will be sorely missed in 2012-13. Washington had all sorts of trouble finishing off “the best 3-10 team in America” on Tuesday night, as they were tied with Seattle with less than five minutes to play before sealing up an eight-point win. The Huskies made their hay by getting to the line. Repeatedly. No really. A lot. Like 59 times. The fact that they missed 22 of those attempts certainly kept the game a lot closer than it should have been, but give credit to Seattle and their head coach Cameron Dollar (who will someday be a head coach in the Pac-12, mark my words) for fighting to the end. Tony Wroten shook off an awful game against Utah on Saturday with 24 points and 18 trips to the free-throw line, but he still turned the ball over six times and made a couple bad decisions down the stretch. C.J. Wilcox also bounced back from his worst game of the season by going for 25 points and drilling four threes. The Huskies get back to conference play on Saturday by hosting Washington State. In a press conference Tuesday afternoon, Herb Sendek touched on his decision to dismiss Keala King from the Arizona State team. His comment that “sometimes when you’re a part of a team, you have to make sacrifices and play positions that maybe aren’t ideal” indicates that King was upset at having to play the point after freshman Jahii Carson was declared ineligible and transfer Chris Colvin didn’t pan out as the lead guard. King wasn’t really cut out to be a point guard (he turned the ball over on more than 28% of his team’s possession – a far sight better than Colvin’s 34%), but he appeared to be the best of a bad lot. Now, Sendek turns to junior Trent Lockett at the point. Lockett isn’t an ideal candidate for the point either (he turned it over 11 times in ASU’s two games last weekend, but did hand out eight assists), but at this point, he’s the only legitimate option Sendek has. For the first month, maybe five weeks, of his freshman year at Arizona, Nick Johnson looked like anything but a freshman. He played with a confidence and a consistency that belied his year. But, here we are in January and Johnson has but up clunkers in four of his last five games and seems to have lost all confidence in his jumper last week in Southern California, hitting just three of his 15 field goal attempts and missing all six of his three-point attempts. But Johnson remains cool and collected and expects to work through this slump and come out better for it on the other side. Johnson’s teammate, Kyle Fogg, has seen a slump or two in his day too, but now a senior, he is climbing up all manner of career lists in Tucson. When he started on Sunday against USC, it was his 101st career start, moving him into ninth place on the all-time Wildcat list, tied with Steve Kerr and Reggie Geary. If he continues to start the rest of the year, he’ll have a good chance to pass Salim Stoudamire and Channing Frye to move into fifth place, but Jason Gardner’s record of 135 career starts is completely safe. Beginning to look ahead to the weekend, Oregon point guard Jonathan Loyd is questionable for the Ducks’ Thursday night game at Arizona State, after sustaining a bruised knee in Sunday’s loss to California. He may test his knee in practice today, but it looks like he may be a game-time decision tomorrow night. If Loyd is unable to go, Devoe Joseph and Garrett Sim will be the only two guards available to Dana Altman who have averaged more than 10 minutes per game. Freshman Brett Kingma, a three-point specialist who has struggled with his shot, would be the guard most likely to pick up the extra minutes if Loyd is out. Strengths. 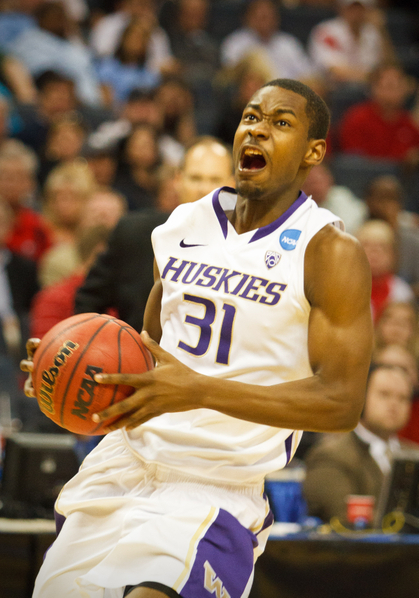 The main thing that jumps off the page is the Huskies’ talent and depth at guard. In order to get all of the talent on the floor at the same time, Lorenzo Romar could go with the rarely used four-guard lineup since both Tony Wroten, Jr., and Terrence Ross have the size to play down low. Watch out for the other freshmen as well. Romar has a stellar recruiting class coming in, led by the aforementioned Wroten Jr., guard Hakeem Stewart, and forward Martin Breunig. All three appeared on the Rivals150 list, while Wroten was considered the fourth-ranked point guard and No. 14 overall player in the country for the class of 2011. Weaknesses. In the past six years, the Huskies have always had some sort of leader or go-to guy to build the team around. They don’t have a “set” leader going into this season, so that will be a huge thing to work out in preseason practice. They also need to find a go-to scorer that they can count on late in games as they lose their top three scorers from last season (Isaiah Thomas, Matthew Bryan-Amaning, and Justin Holiday). Nonconference Tests. The Huskies should fly through their non-conference slate with the exception of two games: Dec. 6 vs Marquette and Dec. 10 vs Duke. There is no break in between for Washington, as they will just stay in the Big Apple for six days and take on a pair of top twenty teams. I’m predicting an 0-2 record in those, but if they can even earn just a split, the Huskies will start to receive national attention. ATB: Holiday Hoops? Yes, Please. The Lede. If you’re anything like us, and we suspect that you are, you spent tonight stationed in front of your television (hopefully HD) for anywhere between four to six hours, munching on way too many Christmas cookies, filling your stomach with eggnog or some similar milky concoction, and watching game after game of college hoops. Now Texas, now Michigan State and Illinois! On, Mizzou! On Gonzaga, on Kansas and Cal! To the top of the polls! To the top of the key! Now get out on the break! Fill those lanes! Throw it down, all! It was Holiday Hoops at its best this evening, with several marquee matchups on the tube and nothing else on our agenda other than to nod knowingly when the Significant Other Unit started complaining about finishing the shopping. This guy pretty much nailed it when he said that having the holiday spirit combined with some great hoops on the TV tonight equaled one incomparable thing: bliss. Your Watercooler Moment. What the Hell is Wrong With Michigan State? Nothing. The Spartans are who they are. They were never the second-best team in America — not this year, not last year, nor the year before. In explaining why there’s nothing wrong with them, we got a little word-happy and decided to turn it into a separate post, which is located here. Just remember that March basketball is a different animal than December basketball and that Izzo knows and understands this, and you’ll be fine. Whelliston’s Red Line Upset Record. The Mid-Majority’s record of what he calls “red line upsets” was equaled tonight with ten teams from mid-major leagues defeating major-conference teams. The Las Vegas Classic was particularly inspiring for the little guys, as New Mexico dropped Colorado and Northern Iowa got past Indiana. The others: North Texas over LSU, Siena over Georgia Tech, Dayton over Seton Hall, Cleveland State over South Florida, Seattle over Virginia, Furman over South Carolina, Green Bay over Wyoming, Butler over Utah, and Northern Arizona over Air Force (note: Whelliston considers the Mountain West a major conference). And nice representation among the power leagues, with the MWC dropping three games and the ACC, Big East and SEC grabbing two a piece. Shockingly, the Pac-10 had none tonight (and yes, Oregon State played — see below). Tristan Thompson. 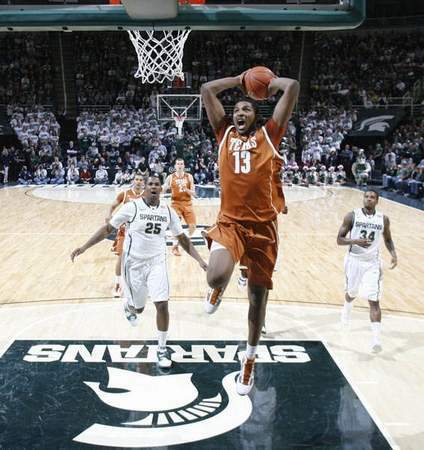 The 6’8 freshman forward was seemingly everywhere for Texas tonight, dropping 17 points and grabbing 15 boards (six offensive) against the typically beefy Michigan State front line. He’s had his ups and downs this season, but tonight was his best performance of the year, and if Rick Barnes can convince this human pogo stick to crash the glass like this on a nightly basis, Texas suddenly becomes a darkhorse Final Four candidate this year. Jordanesque. Coming off the bench nursing a sprained ankle to hit several key FTs down the stretch to get a big road win? That’s what Marcus Jordan did tonight at UMass in a tight contest that could have gone either way, the first such exposure for UCF as a nationally-ranked team. We’re not going to oversell this — after all, he only scored seven points in fifteen minutes — but UCF is turning into one of the better stories of this college basketball season, and a large part of it due to Heir Jordan.